I mean she’s not trying to save your life by becoming a doctor or anything, but she is trying to protect the environment by purchasing a Toyota Prius, which in turn could mean cleaner air, which in turn could mean less issues with your breathing/lungs, which in turn could mean a longer life for you. See, she really is helping. Sure that was a stretch, but there isn’t always a lot to say about Mandy Moore. 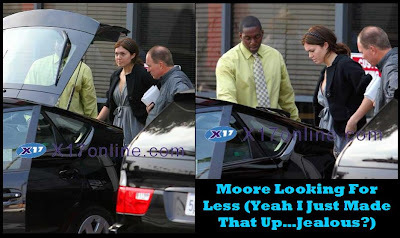 How do we get to say more about Mandy Moore? Ok now, say it with me…all together now: “Become a drunken whore like Britney Spears.” See? We have learned a lot from this blog. Oh, she seems like a good kid. Seriously, I’m finding it hard to think of something to knock her for. What is happening to me? Must shut down.